China is in the process of allowing its currency to rise. The reason for this is to address the worsening inflation rates in the country. Allowing the yuan to rise will indeed stop, or slow, inflation, but the way this fix works is not the way that is usually assumed. Neither will the effects of this policy be what most observers assume, i.e., just milder inflation. Instead, it will be an outright economic bust. This article explains the real story behind the commonly espoused explanations regarding the taming of China's inflation. It also breaks down many of the peripheral issues on the topic that are regularly discussed in the press, and exposes the false theories associated with these issues. Policymakers have sent a clear message that currency appreciation will be used as a tool to counter imported inflation [due to near-record global prices for oil and other commodities]. Chinese officials may also seek to speed up gains in the currency, also known as the renminbi, to fight inflation, lowering the cost of imported U.S. goods such as Boeing Co. aircraft and Microsoft Corp. software. But currency changes can indeed affect prices by way of changes in the supply of goods. A country whose currency is artificially undervalued — such as China — will artificially export more and import less. If the currency is allowed to rise towards the market exchange rate, it will begin to export less and import more. All else being equal, a higher-priced currency will indeed result in a lowered price of imported goods. When imported goods cost less, consumers have more money to spend on domestic goods; purchasing power increases. Or, if the amount saved from spending less on imports is spent on acquiring greater amounts of the imported goods, there will be less demand for domestic goods, causing domestic prices to be lower. In either case, what has lowered prices is a stronger currency. The previous explanation applies only to cases where "all else remains equal." But a currency that rises with all else remaining equal is one that was previously artificially weak for the purpose of exporting as much as possible and is thus being revalued by the marketplace to its true market price. Otherwise, excluding short-term fluctuations, one currency moves against another because of changes in the relative supply of currency units, and corresponding changes in relative consumer prices between the two currency regions in question. Currency movements absent these fundamental changes are due to government manipulation of the currencies. The flip side of the rise in the price and purchasing power of a currency is that goods in that currency are then more expensive in terms of foreign currencies, resulting in fewer goods exported. Exporting less is economically beneficial, as it leaves more goods remaining inside the country, increasing the supply and lowering the price of domestic goods. Therefore, it would seem that higher-priced currencies are better since they result in cheaper imports and lower domestic prices. But, if the currency is too expensive and artificially overvalued, fewer goods are exported, causing less foreign exchange to enter the country. An artificially high currency will eventually cause the country to run out of foreign exchange. This, and goods too expensive from the view of other countries, will cause trade to cease, resulting in lower standards of living. The essence of the trade-off is that a country can have a weak currency and increase exports so as to obtain more foreign currency, or, it can have a strong currency and increase imports so as to obtain more goods. So, then, what is the optimal level of a currency's price? Does a country want a stronger currency or a weaker one? Does it want more cash or more goods? The fact is that a country is not an "it." A country consists of millions or tens of millions of individuals, each having different goals and different valuations. Government bureaucrats cannot set an ideal currency price that is optimal for everyone. Thus, the only optimal currency price is that which is set by all market participants jointly by way of their supplying and demanding both goods and currency based on their needs and desires. And in reality, the optimal currency price they, the market, will settle on will be the price that, adjusting for transportation costs, causes domestic prices of internationally traded goods to approximate the price of those same goods in other countries. In other words, they will make relative prices equilibrate across countries, just as individuals do within a country. Otherwise arbitrage opportunities would exist, and the result would be a leveling of relative prices and real currency valuations. That optimal currency price will also result in the country exporting about the same amount as it imports; the balance of payments will tend towards zero. Trade surpluses and deficits derive from mispriced currencies arising from government manipulation. A manipulated currency can cause domestic prices to be artificially higher or lower than they would otherwise be, but it cannot cause prices to rise on a sustained basis; it cannot cause price inflation. Aside from rising prices due to a continual reduction of goods produced and existing in a country, the only thing that can cause price inflation is that country's expansion of the money supply, which results in increases in demand. Aggregate prices rise only with reduced supply or increased (monetary) demand. Thus, contrary to the popular perception displayed in the quotes above, China's repricing of its currency — alone — will not reduce price inflation. What will reduce China's price inflation is ceasing the activity that is holding its currency artificially low: money printing. As Figure 1 shows, it is doing just that. In general, China can keep its exchange rate even with the dollar only by creating new money at as fast of a rate as the Federal Reserve creates dollars. In addition to the rate of creation of one currency versus another, the amount of currency actually on the market available for exchange makes a difference as well. In this respect, China reinvests the dollar reserves it obtains from its trade surplus — which come about from an artificially low yuan and an artificially high dollar — into US treasuries, instead of selling them in the foreign exchange market, so as to prevent the dollar from falling (and yuan rising) from the increased supply. But additionally, in order to keep the yuan artificially lower against the dollar than it would otherwise be given the market supply and demand for each currency, the Chinese central bank, the Peoples Bank of China (PBOC) actively buys dollars and sells yuan in the marketplace. It pays for the dollars by creating yuan with which to buy them. When the PBOC creates yuan, it expands the money supply. 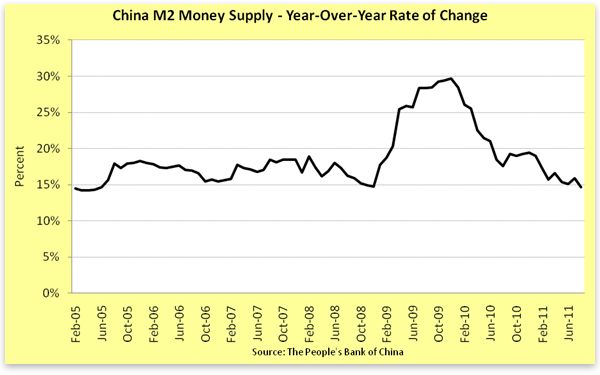 It is therefore this expansion in the money supply, not an artificially low currency per se that is creating price inflation in China. Strengthening the exchange rate can help reduce inflationary pressures and rebalance the economy, the World Bank said in its latest quarterly update on the world's third largest economy. Inflation expectations can be contained by a tighter monetary policy stance and a stronger exchange rate. While the comment is still vague in terms of giving the real link between monetary policy and the exchange rate, it at least notes the monetary-policy issue. Economists blame China's inflation on the dual pressures of consumer demand that is outstripping food supplies and a bank lending boom they say Beijing allowed to run too long after it helped the country rebound quickly from the 2008 global crisis. The fact is that both the "lending boom" and "consumer demand" are simply the manifestation of monetary inflation, and originate solely from the PBOC's expansion of the money supply. Real consumer demand results in falling, not rising prices. The only component of consumer demand that is pushing prices higher is artificial monetary demand in the form of more paper bills in consumers' hands driving up prices, not in an increased desire to consume a greater physical quantity of goods. For a deeper understanding of this concept, see the third section of this article. As for a bank-lending boom, a boom in lending can occur only when an increase in money available to be lent is increased dramatically. So to say that inflation is caused by a lending boom is to say that inflation is caused by the printing of money (but without actually saying it). Though this cause and effect is obvious, reporters — and economists — choose to circumscribe the real explanation. 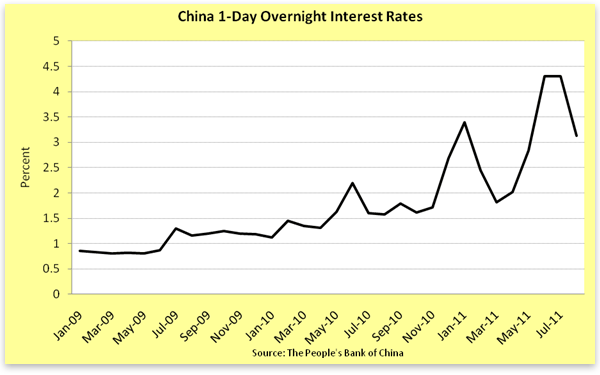 So what has the Chinese government done about the lending-boom and consumer-demand problems? The government has clamped down on lending but analysts say it will be months before the effects of that and other curbs are felt. They say inflation should climb further through at least midyear before easing. The government has "clamped down" mainly by raising interest rates, as shown in Figure 2. Mainstream economists believe this will do the trick, as they think that interest rates are the primary means of growing and slowing an economy. They ignore, or are not aware, that the money supply is what is driving inflation, "demand," and GDP growth. Manipulating the interest rate alone, without — as happens in most central-bank-run economies — simultaneously changing the money supply will usually have little effect. Sure, with higher interest rates, borrowing costs are higher. But inflation also raises the rate of profit, which means business can profitably pay a lot higher rate to borrow. But even when interest rates exceed the height of the rate of profit and cause businesses to quit borrowing and investing, all the money that has been pouring into the economy will still push prices higher. Economic activity might slow or stop, but prices will still rise. The only thing that will stop inflation is ceasing to expand the money supply. And even that will have a delayed effect. Attempts at price controls, subsidies for the poor and orders to local leaders to guarantee adequate vegetable supplies have had mixed results. Beijing also has resorted to the blunt tool of freezing prices of electricity and some other basic goods, but that is starting to backfire. In other words, the government has tried to further manipulate the economy to compensate for the adverse effects of its printing of money. It should be no surprise the results are "mixed," and are "starting to backfire," as shortages are the natural result of price controls. Beijing also is struggling to control an overheated economy that expanded by a rapid 9.7 percent in the first quarter of this year, barely slowing from the previous quarter despite Beijing's efforts to steer growth to a sustainable level after 2010's double-digit gains. Though the news report says "also," in reality this is the same monetary issue we've been discussing. There is no such thing as an overheated economy. "Overheating" is the Keynesian term for price inflation arising as a result of too much monetary pumping into the economy. It is the monetary pumping that has pushed China's GDP into double-digit gains. As for sustainable growth, it is only monetary GDP growth that is unsustainable. Real, true economic growth is always sustainable and could never exceed what Keynesians call an economy's "potential long-term growth rate." Many countries worry about speculative money flooding their economies and inflating assets like real estate or stocks. The notion of capital flows and money crossing borders is misunderstood by most people. Except for physical paper bills belonging to tourists, to drug dealers, or to foreign workers sending cash earnings home to relatives, money does not cross borders. Money generally remains in the country to which it belongs — and merely changes ownership. As this section will show, "speculative" money "flowing across borders" really consists only of the domestic central bank trying to keep its currency artificially priced. So called "capital" or "hot money" does not "flow" from one country of origin into another country. However, money created in one country can be — and is, to a limited degree — used to buy the currency of another country and direct it into the purchase of asset prices in that country (bidding asset prices higher in the process). If a disproportionate amount of local currency is channeled into asset prices in a country, less currency is being spent on goods and services in the economy, causing consumer prices to fall. But in reality, consumer prices in countries with booming asset markets do not usually fall while asset prices rise; both usually rise in tandem. This is because the local money supply is increasing, and pushing up both classes of prices (i.e., financial assets and consumer prices), even though one is rising faster than the other. It is therefore local money, not foreign money, inflating assets. Also, in order for foreign demand to redirect purchasing power from local consumer prices to asset markets, there would need to be quite an overwhelming demand for domestic investment from abroad, resulting in a very large portion of local currency being purchased by foreigners. It seems fairly unrealistic that, in absence of already-rising foreign markets, such a strong desire for investment in a foreign country would exist on the part of these overseas investors. Additionally, such a massive redirection of purchasing power would cause consumer goods to drop so low relative to their previous purchasing-power parity that foreign consumers, as opposed to foreign investors, would then purchase local consumer goods — because they would be so cheap in local-currency terms to those consumers — for the purposes of importing to their home country (i.e., being exported from the local country). This would increase the value of the local currency. But again, we do not witness consumer prices falling, or currencies rising (because they're usually fixed), in the various countries experiencing asset-price booms. Therefore, the usual originating cause of booming asset prices in a country is that country's central bank creating more money, pushing up both consumer prices as well as asset prices, not foreigners directing the local currency they purchase into asset prices. What's seldom noted is that when a country does not print money at rapid rates, it — almost categorically — does not experience "speculative money flows." International investors and speculators usually take part in investing as a mass movement only in local asset markets that are already booming. The asset markets are booming because a large amount of the money being printed in that country is inserted into financial assets. Otherwise, if the money supply were not expanding, those same asset prices could not rise in price (see this article for a full explanation). Also rarely explained is that "speculative money flows" usually occur between countries that have pegged or partially pegged currencies. Otherwise, as explained above, if the currencies of two different countries are freely floating, as one country expands its money supply, its currency will fall in price against its paired currency. Therefore, as a country's asset markets rise in price, its currency would fall in price, largely in inverse proportion. This would cause the rising asset prices in the country to appear less appealing to foreign investors, as their gains would be offset — upon conversion back to their own currency — by a depreciating currency. Also, if investors just kept buying a currency whose supply was not expanding, its price would rise. This too would cause local asset prices to become less appealing. By contrast, speculators usually keep piling into currencies that are expanding and that are held artificially low, not ones floating freely. Here is the real cause of so-called "money flows": When a country keeps its currency artificially low relative to the opposing or "paired" currency, it does so, as we have seen, by its central bank buying the paired currency with newly created domestic currency. Thus, there is foreign currency "flowing into the country," and the new domestic currency created for the purpose of purchasing the foreign currency is channeled into asset prices (and to a lesser extent, usually, consumer prices). It's true that the domestic central bank takes ownership of foreign currency, but only the domestic currency circulates domestically. Thus it is local currency, not foreign "speculative money" that both causes and sustains local asset prices. It has been shown that China is now letting its currency rise because it needs to stop printing money in order to tame inflation. Its currency has been artificially low (i.e., below the market price) for many years due to the fixing of its price to the US dollar by way of printing the money that it uses for selling yuan (the printed money) and buying dollars. But such actions have resulted in price inflation. Therefore, letting its currency rise will cause a recession, since reduced money-supply and credit-growth rates are the usual initiating factors that bring on recessions (reduced rates of spending alone can cause recessions, but they are usually preceded by prior reductions in money and credit). 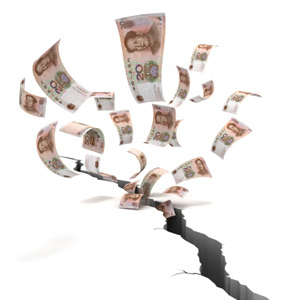 It has been rapid increases in money and credit that have driven the current boom in China, and it will be the reduction in the growth rate of those variables that causes the bust. The economic boom in China has consisted of rapid increases in true economic growth accompanied by — but not driven by — an increase in monetary spending. The increase in monetary spending, in turn, has been driven by wild credit growth, and has resulted in massive overinvestment in particular industries. There has been no shortage of commentaries and videos highlighting building booms, mania-type herd-mentality home buying, and the mass creation of buildings, shopping malls, and even multiple entire cities in China that stand unoccupied — all dramatic yet classic symptoms of credit bubbles. The signs of bubbles are common, and date back to the 1600s. Even if we knew nothing about money and credit and their causing of financial bubbles, we should by now recognize the typical bubble-oriented characteristics — i.e., exponentially rising prices, investment and purchasing manias, exuberance over a new and unusual trend, etc. — and know that they are symptoms representing an actual bubble. Given the lag effect of money and credit on the financial system and its transmission to the real economy, it is difficult to tell exactly when the rising interest rates and slowing money supply will result in reductions in the rate of spending and a reversal of the money multiplier, but when they do, a Chinese credit contraction, financial meltdown, and economic malaise won't be far behind. Mainstream economists and the financial press are usually Keynesian. This means that they like to hide the true cause of economic problems. Their explanations therefore are ones that try to show how the tail can wag the dog. But these fallacious explanations have been around so long and are so widely taught that most people who do not know real economics — including most of these same Keynesians — easily believe these improbable explanations. With respect to their explanations of the Chinese economy, it is not true that China imports inflation and that merely letting its currency rise will solve the problem. The real story is that the inflation is due to the printing of money that keeps its currency artificially low, and that the rising currency is a side effect of doing what's necessary to stop inflation — stopping (or merely slowing) the printing presses. The rub is that a slower rate of money growth will also cause a reduction in spending and a credit contraction, which in turn will cause financial and economic problems. Kel Kelly has spent over 13 years as a Wall Street trader, a corporate finance analyst, and a research director for a Fortune 500 management consulting firm. Results of his financial analyses have been presented on CNBC Europe, and the online editions of CNN, Forbes, BusinessWeek, and the Wall Street Journal. Kel holds a degree in economics from the University of Tennessee, an MBA from the University of Hartford, and an MS in economics from Florida State University. He lives in Atlanta. Send him mail. See Kel Kelly's article archives. © 2011 Copyright Kel Kelly - All Rights Reserved Disclaimer: The above is a matter of opinion provided for general information purposes only and is not intended as investment advice. Information and analysis above are derived from sources and utilising methods believed to be reliable, but we cannot accept responsibility for any losses you may incur as a result of this analysis. Individuals should consult with their personal financial advisors. Don´t see the point, US dollar in hyper-inflated, money printing is USA is huge... So China, with no crisis and no deficit, and no Systemic Crisis buy printed dollars with printed yuans...and -of course- the economic growth of China is bad...but the Systemic Failure in west is what? a good news? RossWild, There is a crisis in China. Also,debt in China is a real issue. If you factor in local government debt per province, you get a real debt of about 90% of GDP in China. Not the 20% that the IMF touts. Anyways, obviously you cannot continue to build buildings that go on unoccupied. China is rife with overinvestment. Another point is that fixed investment in CHina today equates to about 50-60% of GDP! In other words, the fixed investment IS the growth. Without it, the growth goes south real quick. What makes issues worse, is the inflation. Prices in China are actually similiar to what they are here in the US. The problem is, the median chinese income is less than 1/10 of that in the US. Which makes for a MASSIVE non-loan performing problem. It is because of this, that CHina is due for a correction. The thing is, I dont see China coming out of this correction much better than Japan did back in the 90's. China needs to expand its consumer class. The problem here is also pointed out in the article above. Also, to add a bit more on that. The chinese only consume about 30%..(offical figures from the Chinese government, so take em with a grain of salt) That is less than it was in the year 2000. I always cringe at people who pump up China. Just the other day, Michelle Bachmann regurgitated the falsified documents suggesting that china will overtake the US economy by 2015...I knew she was retarded, but that right there left whatever doubt was left.